Ischia is situated in the Gulf of Naples in Southern Italy, around 30 kilometres (18 miles) from the nearest city, Naples. Ischia is the biggest island of the Campanian archipelago and especially during July and August is full of tourists. This island has a lot to offer, you can enjoy a day in its marvellous sea and another are climbing Mount Epomeo that has one of the best view over the gulf of Naples. Ischia has three ports: Ischia Porto is the main one, where many ferries dock; Casamicciola is located in the North; Forio is the smallest. Naples is served by two ports Calata Porta di Massa and Molo Beverello. From Molo Beverello depart high speed ferries, from Calata Porta di Massa slow and regular ferries. There is a free shuttle between the two ports. To Casamicciola and Forio there are just high speed ferries from Molo Beverello. The cost is 18-19€ and both take about 60 minutes. Tickets are sold at the pier. Notice that at summer time, especially at weekends, it might be crowded, hence it might be better to arrive a little bit earlier to be sure to find the tickets. If you want to avoid the queue you can buy the tickets on line on www.traghetti-ischia.info where you can also find the ferry time table. Some ferries stop at Procida before Ischia. Whether you arrive at the airport or at the train station there is a bus that leaves every 20 minutes and links all of them. In fact the Alibus Company bus makes only five stops: Airport, Via Arenaccia, Piazza Garibaldi, Via Marina, Piazza Municipio. The first stop is outside the terminal 1, at Piazza Garibaldi where the Garibaldi train station is located; the stop of Via Marina allows customers to reach the terminal Porta di Massa (or Varco Pisacane) and the stop Piazza Municipio allows customers to reach the terminal Beverello. From the Airport to the ports it takes about 40 minutes, while from the train station 15-20 minutes. The ticket is 4€ and you can buy it on board. Naples is served by a third smaller port called Mergellina. This port is closer to Ischia, so the journey is shorter, but there are less ferries. To get to the port you can use the second tube line (Metropolitana) or one of funiculars; they both arrive at Mergellina train station. To Ischia Porto it takes 45 minutes and it costs 18,70€. To Forio it takes about 60 minutes and it costs 18,90€. Pozzuoli is a city and comune of the Metropolitan City of Naples, in the Italian region of Campania. To get to Pozzuoli from Naples you can use the second tube line or the Cumana train line. To Ischia Porto it takes 60 minutes and it costs 11,00€. To Casamicciola it takes about 60 minutes and it costs about 11,00€. The port of Marina Piccola, situated in a small cove on the Sorrento Peninsula, is located a few steps from Piazza Tasso in Sorrento. Getting to Marina Piccola from the train station is very easy, it’s just 12 minutes on foot. Since there are some stairs from Piazza Tasso you should know that there is also an elevator at the Villa Comunale. The trip to Ischia takes about 60 minutes and it costs 21,20€. From these places there are ferries only at summer time. The Alicoast company offers a service from Salerno (Molo Manfredi) to Ischia Porto. The ferry stops at Amalfi, Positano and Capri. From Salerno it takes 2 hours and costs 26,10€. From Amalfi it takes 90 minutes and costs 25,00€. From Positano it takes 70 minutes and costs 24,50€. From Capri it takes 50 minutes and costs 18,30€. 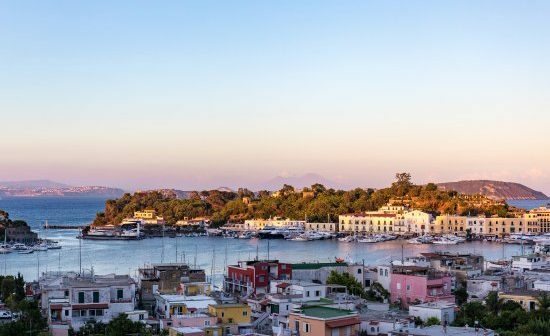 The Ischia cruise company also takes 50 minutes, but stops at Ischia Porto, Casamicciola, Lacco Ameno and Forio, it costs 16,50€. 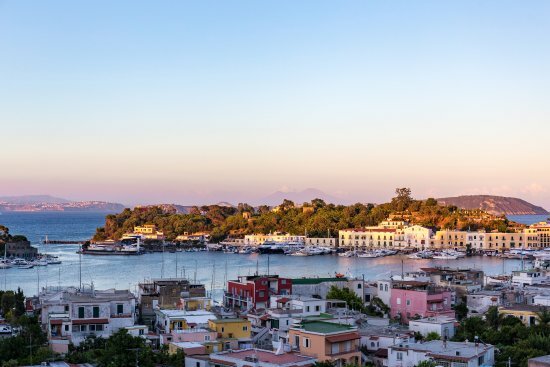 Those two islands are part of the Pontine archipelago and from June to September the Captain Morgan company operate a passenger service on the route Ischia – Ventotene – Ponza.